**DOORS open at 6:30pm - SHOWTIME is at 8:00pm. 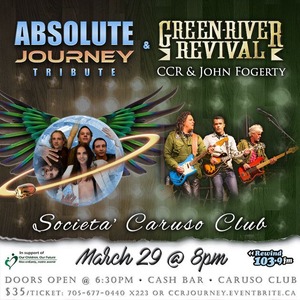 ***If you are searching for North America’s most authentic sounding CCR tribute, look no further than Canada’s own Green River Revival. Their version of “Down on the Corner” sounds so much like John Fogerty you’ll swear it is the real CCR! The members of this band have played in CCR tributes across Canada, Scandinavia and the U.S. for the past decade and now they have joined together to bring you the ultimate Creedence Revival.The show presents the music of CCR with a storyline that incorporates all the Creedence hits and includes several costume changes. Chain gang prison uniforms right out of the song Midnight Special, those plaid flannel shirts made famous by Creedence in the 60’s and you gotta see the boys dressed in army fatigues depicting the era of John Fogerty’s Vietnam protest songs! !~~~~~~~~~~~~~~~~~~~~~~~~~~~~~~~~~~~~~~~~~~~ Absolute Journey Tribute is a live performing band that brings the essence of Journey to a live stage near you.Performing Journey to the highest level of musicianship with outstanding vocals as sung by Riccardo Curzi. His vocal talents are one of the closest things you will ever hear compared to Steve Perry. The band complements him with amazing backing vocals and wows the audience with an exciting and energetic live performance.Absolute Journey Tribute brings to you a faithful reproduction of the Journey live show, enriched by audience interactivity and true-to-the-original costume changes.To say the least, after watching Absolute Journey Tribute, you will feel like you have left an actual Journey concert … and that is our goal to leave a lasting impression on our audiences.